What a blast! 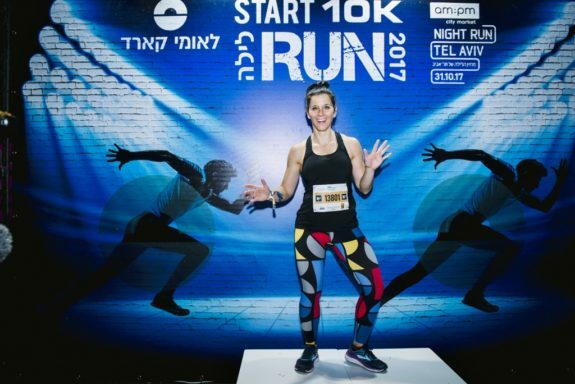 Put the Tel Aviv Night Run in my top 10 favorite races! Ok, so, truthfully, I’m typically not much of a night runner. I’m a grandma and usually go to bed before the race’s start time, but, wow, the energy at this 10k was something else. The second that we arrived at the event, you could FEEL it. 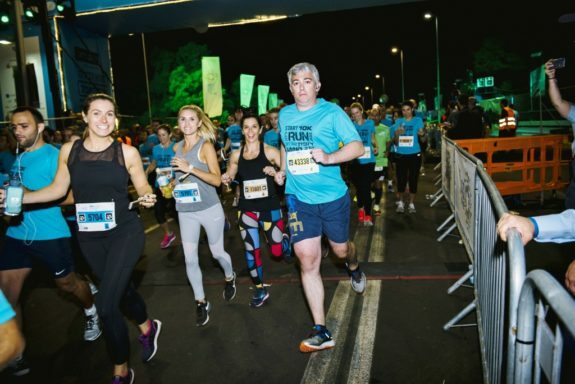 It was quite the party atmosphere with lights and music, and it immediately made me excited to run the race. Vibe Israel hooked us up with access to the VIP tent, so we didn’t wait in line for the bathroom and it was a good spot to meet everyone before and after the race. 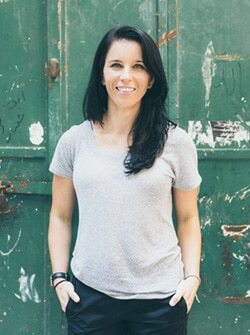 Our group of influencers possessed a mix of fitness experience – some of us were runners, some of us were… not. Charlie runs marathons (she has 3 on her calendar right now! ), but Rebecca, Danny , and Jorge had never run a 10k. They were actually kind of nervous about the whole thing, so we decided to run together for moral support. Right before the start of our wave (there were 25,000 runners), our group photographer led us right to the front of the start to try to get some photos. Minutes later, we were off and running, and, whoa, it was crazy (and kind of terrifying). Being in the front of a huge, crowded race was nuts, especially with runners bumping into us and flying by. It was exciting to say the least! Unfortunately, with the craziness of the start, we lost Jorge almost immediately, but he finished his first 10k with a huge smile on his face! By the time we reached the first 1/2 mile, the crowds lightened up quite a bit and the four us were able to stick together for the rest of the race. Charlie and I paced our group, and she gave us mileage updates all along the way. The course was pretty flat with a couple of small hills and weaved throughout the city, which was quite happening for a Tuesday night. There were lots of people dining al fresco and hanging out at bars while spectating the race. There was also plenty of music, lights, and crowd support – it definitely felt like a party at times! Once we passed the halfway mark and realized we could break 60 minutes, we slowly started to pick up the pace. As we got closer and closer to the finish, our pace continued to increase and concluded with an all-out SPRINT on the final 100 meters over the finish line. We finished just over 57 minutes, and I am SO PROUD of Rebecca and Danny for completing their first 10k with such a strong finish, especially since they were so apprehensive at the start of the race. They really crushed it! Once we finished, we received our glittery medals and headed to the VIP tent for snacks, beer, and plenty of celebration! What a fun night! 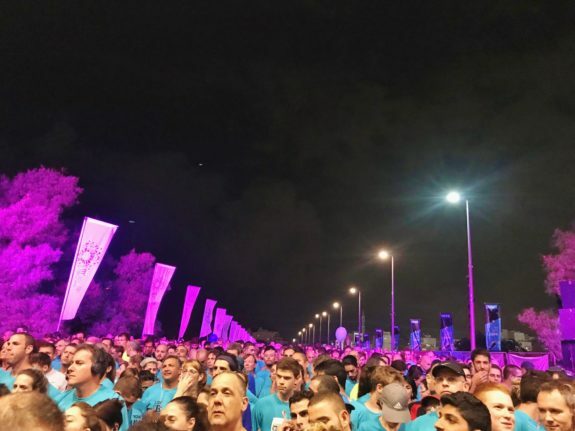 The Tel Aviv Night Race is definitely one for the books! If you’re thinking about visiting and want to add a little fitness to your itinerary, I highly recommend keeping this race in mind. It was such a fun way to experience the city! 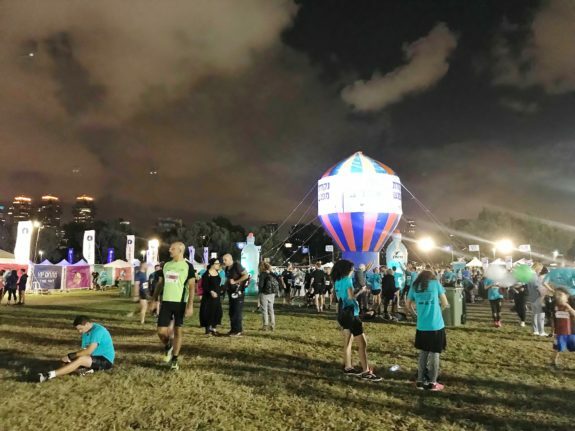 Have you ever run a race at night? How’d it go? Have you ever run a race in another country? If so, which one(s)? I ran the Army Ten Miler shadow run in Afghanistan. We ran it on Kandahar Air Field, which was a cool experience. It was awesome to see how many Soldiers, airmen, sailors, and people from other militaries around the world came out to run the race! Definitely one I’ll never forget! How amazing! I have did a small one in Portugal and it was so much fun! It looks like you’re having the time of your life! What an experience and certainly memories for a lifetime! 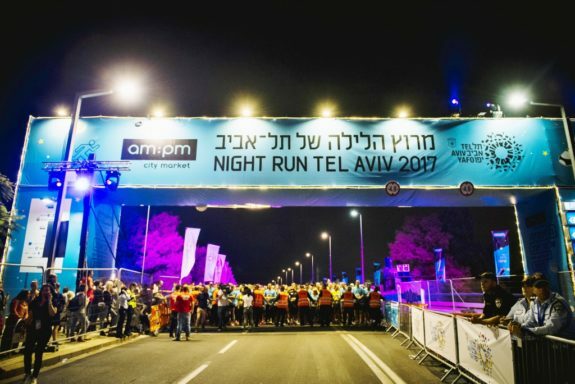 I’ve never participated in a night run or in another country, but would love to one day. Sounds like an awesome experience! A great way to see the night life without having to go to the bars or grab a late night dinner. I’ve never done a race out of the country but I work with race directors that put on top notch events from all over. I find race directors from other countries to be extremely passionate about the participants experience and making sure the entire event from expo to the after party is one of the best you will attend. Congrats on your 10K time! Oh my gosh, so fun! Im not a night runner or workouter either, but I would join this! Love your fun pants hah! Long time reader! was shocked to see you in Tel Aviv! Im posted here with the foreign service for the next couple of years. We are loving it so far. Very expensive buy kid friendly. Glad you enjoyed it! hope you get out to the West Bank a bit. Lots of great hospitality, culture and food there too. I think a night race would be SO hard! 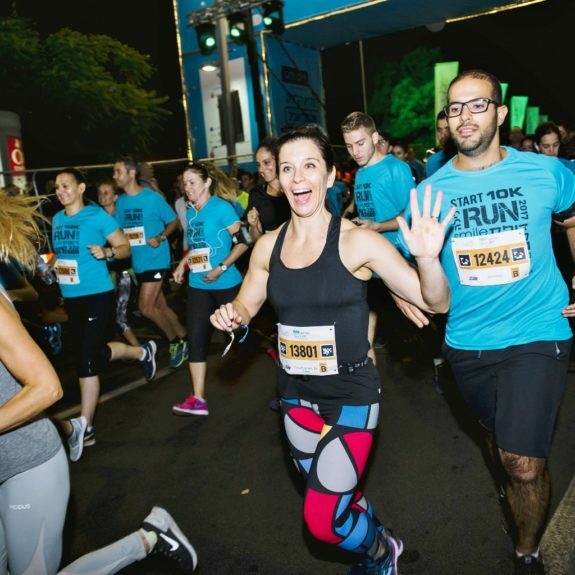 I can’t barely get myself to take a yoga class at night let alone run a race! I would love to do a night race, but 25,000 people is a huge crowd! That would make me super uncomfortable…I don’t like crowds at all! I saw your IG stories and it looked like such a fun race. I’ve always wanted to do a night one. This. Looks. So. FUN. I have never run a night race, but I think the energy would be magnetic! 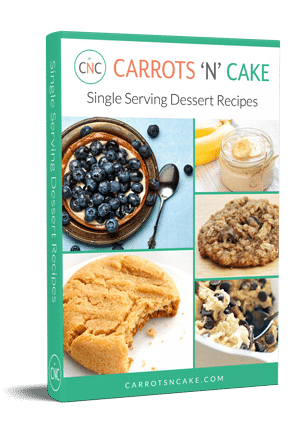 Any D.C. area people around here that have one to recommend? I’d sign up in a heartbeat! 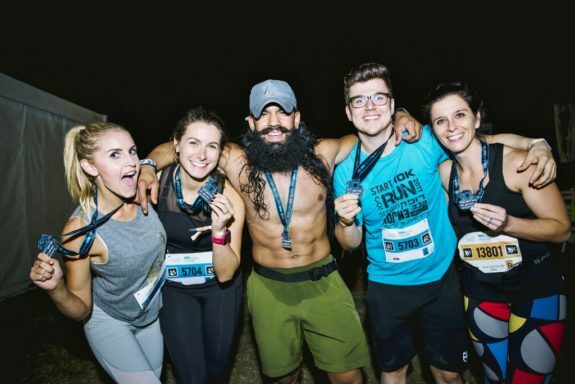 The best part of this recap is the comradery of the group and that you guys paced them and stayed with them, even as experienced runners and probably your first race in this destination. I love Tel-Aviv! One time my daughter talked my husband and I to do a 5 k on the beach after 10:00 pm. She had plenty of time to loose her glasses in the water that afternoon and she can’t see a thing without them. So we had to hold hands and guide her thru the holes in the sand that night. Had a blast!! What an amazing experience! Awesome job. That race looks so cool! 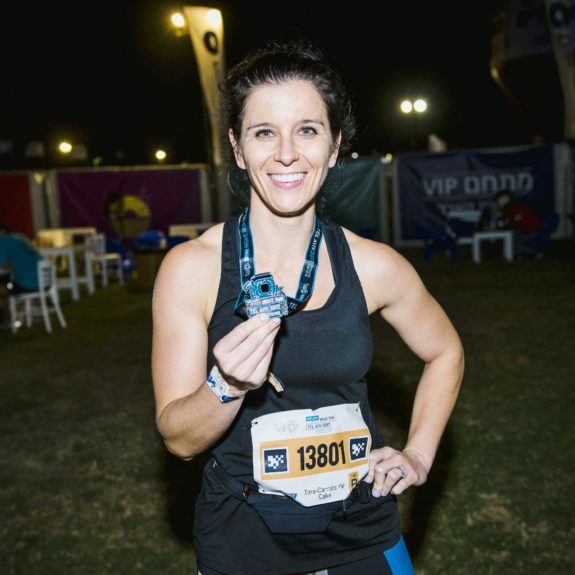 I’ve never run a night race or one in another country, but running a marathon in another country is definitely on my bucket list! I also heard the Las Vegas Marathon is really neat and takes place at night when everything is lit up. What a cool experience for you though! !